Our fourth month on the road starts with us still in Roma enjoying warm weather and clear skies. Tracey is still 'enjoying' working with the old folks at Roma hospital and I have been doing a huge number of odd jobs around the motorhome. The floor tiles are still waiting to be done - we had the floor resurfaced with hardboard but despite insisting that it be glued as well as stapled - they forgot to glue it. They are going to have to rip it all up and do it again. On Wednesday evening we had a good down pour of rain and the window leaks arrived again. I have had another go at sealing them - this time I am 99% sure that they are right. We are parked at a reserve near a small lake known locally as Lake Neverfill. It is a nice quiet place about 2 km from Roma. Apparently most of the year it is dry (hence the name) but right now there is lots of water and Tracey has been trying to catch yabbies (no luck yet). For you Kiwis, yabbies are small freshwater crayfish - kura. BTW - thanks to everyone who has emailed saying that they enjoy reading about what we are up to - it provides incentive for me to keep it up. We had a good rainfall here a few days ago and I managed to get the motorhome bogged down by the lake. When the rain continued for more than an hour I though it best to get the motorhome onto more solid ground (Tracey was at work). When I went to move, the front wheels sunk and the back wheels just spun. It took me about two hours (in the pi**ing rain) to dig and block the motorhome out of the hole. I would have just left it there had it not been for the need to use the motorhome the following morning for Tracey to sit her MR licence (equivalent to the NZ HT). After much messing around I finally got onto solid ground - and learnt a thing or two in the process. BTW - Tracey successfully completed her licence so now she can drive the motorhome without me sitting beside her (I'm not sure if that is a good thing or not :-). The tiling of the motorhome floor is complete and it looks great (even if I do say so myself). This was the last big job before we can say that the inside of the motorhome has been refurbished. I did most of the easy bits and Tracey did all the tricky bits - she is far more patient than I am and is quite happy to muck about with a fiddly bit for hours (it drives me nuts just to watch - however the results are superb). I had a look at the leak in the washing machine that has been getting worse quite quickly - unfortunately it was fairly serious. The main wash tub bowl has rusted through and the main seal is shot. We decided to check out the local second hand shop to see if they had a good cheap replacement. 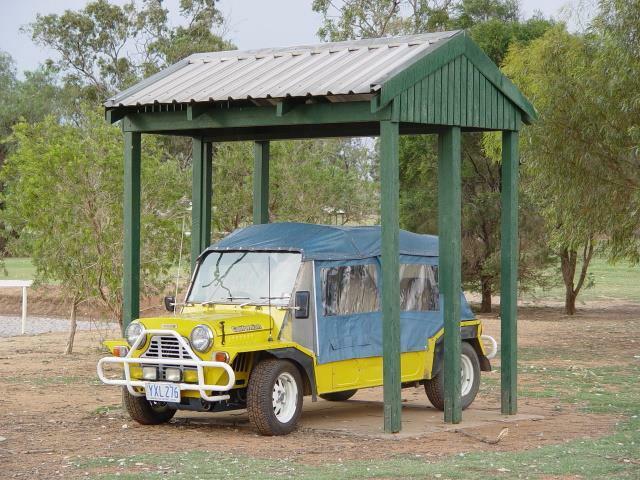 They had three - all slightly larger - just a few millimetres - but those who have seen the motorhome and how the moke fits into it will know that there are only millimetres to spare. After lots of hard work and some minor alterations (mostly evolving a hammer) the replacement washing machine is in place - total cost - $60 - not bad! Tomorrow we leave Roma, tonight is Tracey's last day at the hospital (although they have asked that she stay on). We will continue on west while the heat is still tolerable.Roma has been a good place to stop for a few weeks - there is a good variety of shops here and our parking spot by the lake has been great (except for getting stuck). Mitchell - we arrived here on Friday. Just a short, 1 hour trip from Roma. Mitchell is well know among travellers for its friendly attitude towards tourists and travellers. The local camping ground is among the best in the state and offers the first 2 nights free (no matter how long you decide to stay). We decided to stay at the showground, it has good facilities - there is a charge we think - but apparently nobody bothers to collect it. We went to one of the four pubs on Friday night to watch the opening of the rugby world cup - a rather run down place desperately in need of a face lift. However - they do have a giant plasma TV screen and very friendly owners! We returned to the same pub on Saturday afternoon to watch the All Blacks take Italy apart. Just on the town side of the bridge over the (dry) Maranoa river is the Great Artesian Spa. This is a natural hot spring. 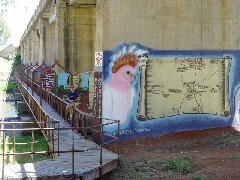 Under the bridge there is a series of murals painted on the supports. Both cats are enjoying the freedom - Tivoli in particular enjoys climbing trees to take a closer 'look' at the local bird life. This Galah is intent on defending its nest of the pesky little Burmese invader. 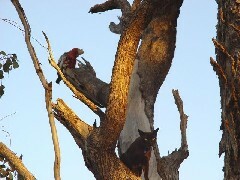 In this photo both are about 30 metres up the tree. Tivoli eventually gave up and climbed down. Charleville - The trip from Mitchell to Charleville was a bit longer than I expected and the road, while sealed is very narrow. There is not room for two large vehicles to pass, so one or both must venture into the red dust that now lines the road. 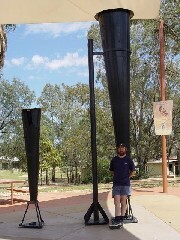 While Charleville is a good sized town (although not large enough for a McDonalds) it has a real 'outback' feel to it. Today we visited all the sights - the School of Distance Education (school of the airwaves as it used to be called) was very interesting, we even had the opportunity to listen into a live lesson. The Royal Flying Doctor visitors centre was quite good too. Quite amazingly, every day, on average, they complete just over 3 emergency airlifts along with dozens of scheduled clinics all over the remote parts of Australia. We hope we never need them, but are glad that they are there! Tracey was interested in the requirements to be a flying nurse. Speaking of weather - this place seems to go from drought to flood and then back to drought again (punctuated only by the occasional devastating hail storm). I think this place is trying to tell the people something - probably "sod off". We are currently parked at the visitors centre (there is a 'no camping' sign here but I see no detailed definition of 'camping' - I could argue that we are just parking). We found a few nice places to camp on our way west. Cooladdi was an interesting place; population 6. It has a pub, general store, petrol station, TAB, motel, restaurant, post office and craft shop. All of these business are of course run from the same premises by four of the six Cooladdi residents (I think that the other two go to school). They were a friendly bunch and we enjoyed watching the All Blacks take Canada apart while drinking at the pub (or was it the Post Office?). 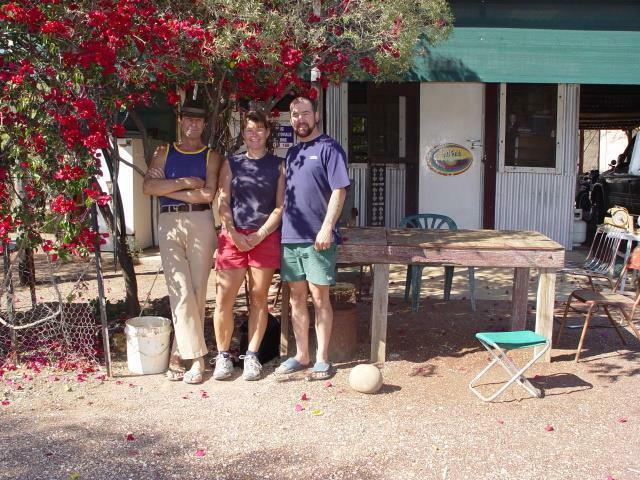 It took us a couple of days to travel the 200km from Charleville to Quilpie. Now we have searched high and low looking for Quilpie's claim to fame - but it just doesn't have one. We are parked by a small lake a few minutes from the town. There is a opal fossicking area not far from here and Tracey went there for a morning and returned with enough Opal to set us up for life (that is if we both had less than a day to live). 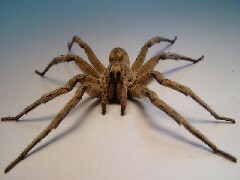 There are lots of birds and other wild life here, it seems to have more than its fair share of insect life. There are 100's of these fine specimens running around in the evenings - enough to give an arachnephobe nightmares (Mike J, are you reading this?). Yesterday we visited 'Baldy Top' - just about the only elevated point for hundreds of kilometres. While not as much of a climb as we expected, we were glad that it was a cooler day - just 32 degrees. 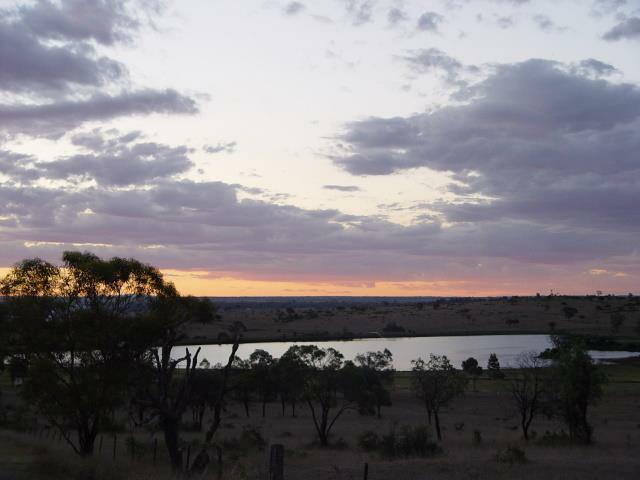 Perhaps difficult to see in this low-res version of the photo, the Moke in near the bottom left and Quilpie township is on the horizon. 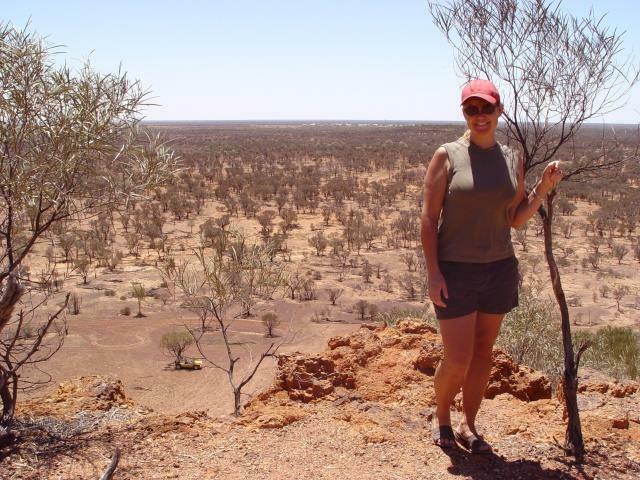 Tomorrow we head south west to Toompine - now that we have outlived the last Opal find, Tracey is determined to find more. There is no cell coverage there so don't expect to hear from us if we find a bolder of first-grade opal. Wed the 22nd we left the main road just north of Toompine in search of Duck Creek - (location of Australia's largest ever opal find). After about two hours and 28,789 corrugations we stopped for lunch. The red dust out here has some kind of magic property. It seems to be so fine as to pass through glass. Our outside bins have about 10mm of dust and the inside of the motorhome seems to have been redecorated from cool blue to outback red. Shortly after lunch we continued a short way then turned off the road onto a fence-line track. About an hour later we arrived at Duck Creek fossicking area and found ourselves at 'Mikes Place'. Mike is the self appointed director of tourism for this place. A very friendly guy, 74 years young, he has lived and mined Duck Creek for the last 30 years. To be honest, he looks more like 54 than 74. He claims that hard work and no television to melt his mind keeps him young. Like all of the 30 or so miners here, he lives in a shack with no electricity (except batteries), no TV and no running water. We also met Bill and Phyllis from Maryborough. Really top guys, we got on with them very well. Bill and Phyllis come to Duck Creek for a few months each year to work their claim. We enjoyed a meal with them and had a four-wheel-drive tour of the area. We will be sure to call and see them when we are near Maryborough. Tracey spent two days 'specking' - this is wandering around on your hands and knees looking for small opal shards on the ground. She found a few (well actually two jars worth of small bits of colour). We also spent a couple of hours working one of Mikes mines with a machine called a rumbler. This produced another two jars of opal bits and three quite promising opals. Mike very kindly gave them all to Tracey. She will spend the next few weeks cleaning and extracting the opal from the rocks and sand stone. We left Duck Creek on Sunday the 26th. On the way back to the main road we passed a hot artesian bore. It had a bath tub there - so we though, why not? It has been quite a while since we have had a bath. So we let the cats out to explore and enjoyed a nice hot bath while we waited for the water tanks in the motorhome to fill. 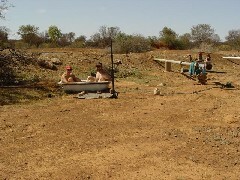 I must admit, it did seem a bit surreal to be sitting naked in a tub of hot water, out in the middle of nowhere. After picking up some supplies at Thargomindah, we headed east, we are slowly making our way back to Mitchell to meet wee Kim. We are currently parked next to a dry lake close to the Bindegolly national park. The 28th saw a midnight exit from beside the dry lake Bindegolly. It began to rain and we are sure that the ground would turn to bog when wet. Of course, by the time we packed up and moved - the rain stopped! We then moved on through Eulo and on to Cunnamulla. Here we ran into a dust storm (or perhaps more correctly, it ran into us). This was by far the most unpleasant day we have spent in the motorhome. The temperature settled down at about 41 degrees and the dust blocked out the sun - so that was a true 41 in the shade. The cats almost expired and we spent some time patting them down with a damp cloth. We decided that it would be a good day to spend a few hours in the local swimming pool. The following day (the 29th) we left Cunnamulla and drove to the tiny town of Wyandra. This is a very friendly little place - the progressive society has built a great free camping ground complete with power, toilets and showers. 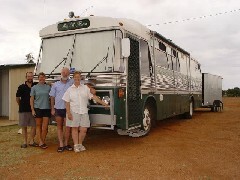 Just as I was cleaning the Moke (almost entirely red from the dust), A big green Bedford motorhome arrived 'Miss B Haven'. This was Wayne and Charan - friends of Trish and Ty! 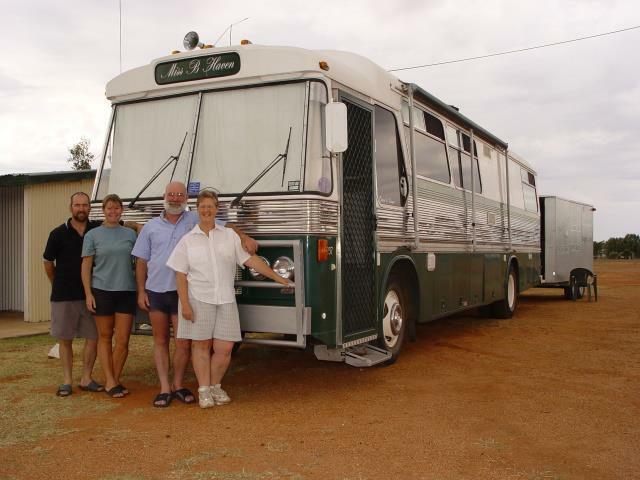 We spent the next two days enjoying their company and trading Bedford manuals and stories. Friday afternoon, we both headed in opposite directions. Us to Charleville and Wayne and Charan to Cunnamulla and on south.